Photographed near Arlington, Maricopa Co., Arizona in December 2007. 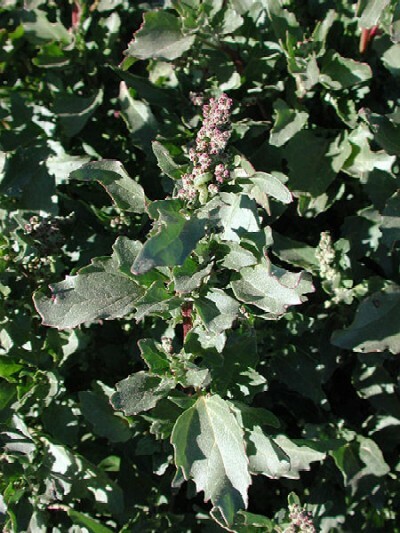 A full-resolution version of this photo is hosted at Wikimedia where there are additional images of Lambsquarters. This illustration was originally published in Deutschlands Flora in Abbildungen by Johann Georg Sturm, (1796). It also is part of the Wikimedia Project. ANNUAL: This leafy weed requires abundant water and so its presence in the Sonoran Desert is dependent mostly on agriculture. Growth is mostly during the cooler seasons. RANGE: A cosmopolitan plant growing usually as a weed in farming areas. LEAVES: Alternate, coursely toothed leaves are whitish on the top surface. The leaves are edible as spinach, however, the plants are known to concentrate nitrogen from fertilizer run-off and so may be poisonous. FLOWERS: Small greenish flowers without petals in dense glomerules arranged in spikey panicle. FRUIT: The capsules are small and contain one each dark seed ... also edible.